← Bay Point Oystering. 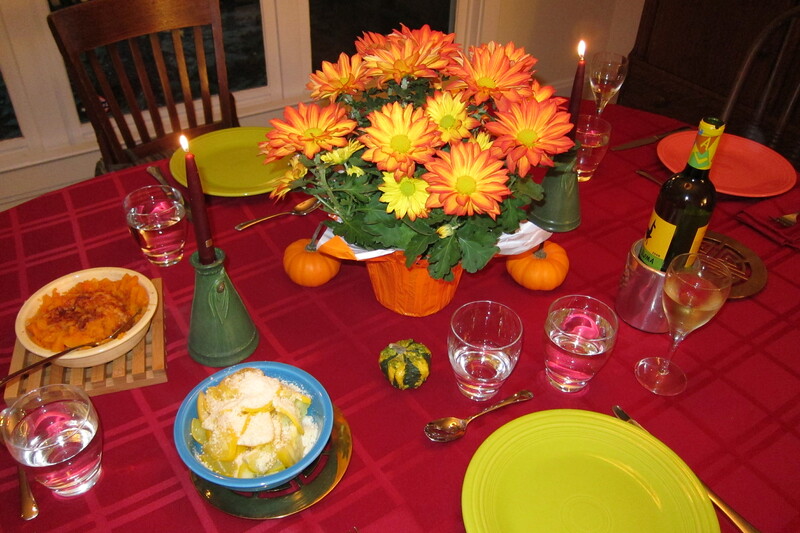 Saturday September 13 (Day 12)…Aw, shucks. “Colorful” is an apt description for Mark and Sue Real, although “passionate” and “knowledgeable” would be good contenders too. We were struck by myriad bright colors and textures from the moment we stepped into the house and saw the variety of Fiestaware vases in the kitchen, fresh local produce on the counter, amazing masks and artwork on the walls, and over 400 books in Mark’s presidential library—more on that in a moment. Digging a little deeper reveals the color, passion, and knowledge these two have in common. It’s great when couples have like interests, something they can speak of as “their thing,” for these two a “Real Thing.” The love of travel, reading, and the outdoors brought Sue and Mark together and provide continuing opportunities to enjoy shared visits to spots on every continent but Antarctica. This “yours, mine, and ours” map shows the places they’ve been separately and together. As a child Sue took summer road trips with her family—somewhat uncomfortably as multi-sibling road trips tend to be—visiting all 48 contiguous states before she was 15. Later, as a manager and executive in the insurance industry, she traveled the world doing business development and acquisitions, including several years living in Italy and Luxembourg. Now she speaks French and Spanish and has been to more than 140 countries! Yes, 140! 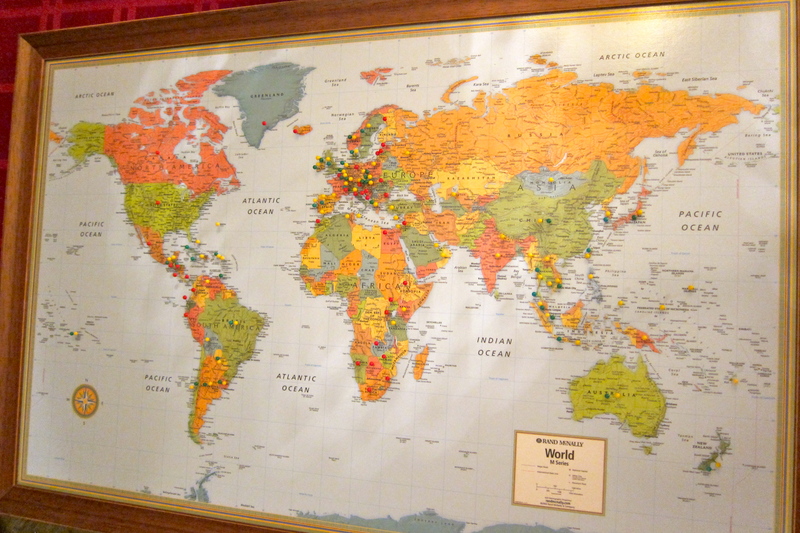 Her part of the map shows far more places that she has already been to than remain to be visited. We walked around their home, looking at the paintings and artifacts on the walls, getting the impression of an artfully curated museum. “This one is from Papua New Guinea. This one from Egypt. 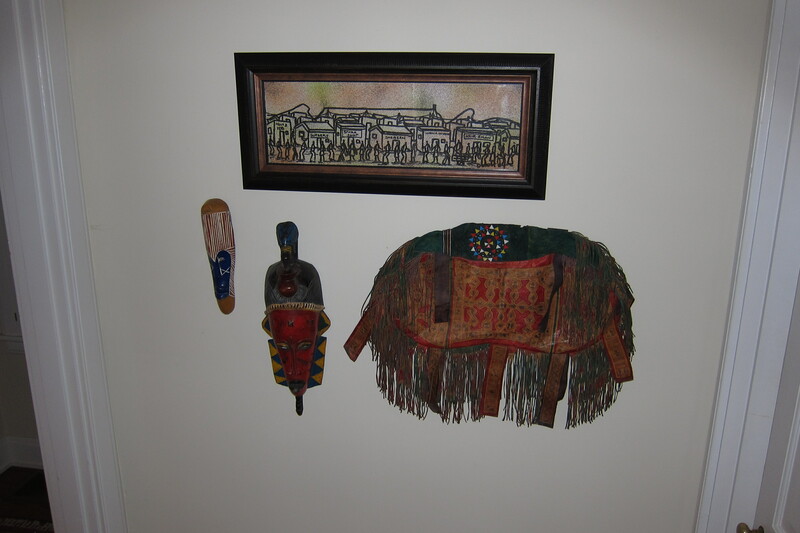 This one from Greenland…Botswana…Guatemala…” I counted dozens of masks on the walls and learned that fifty or sixty more reside in the attic for now. 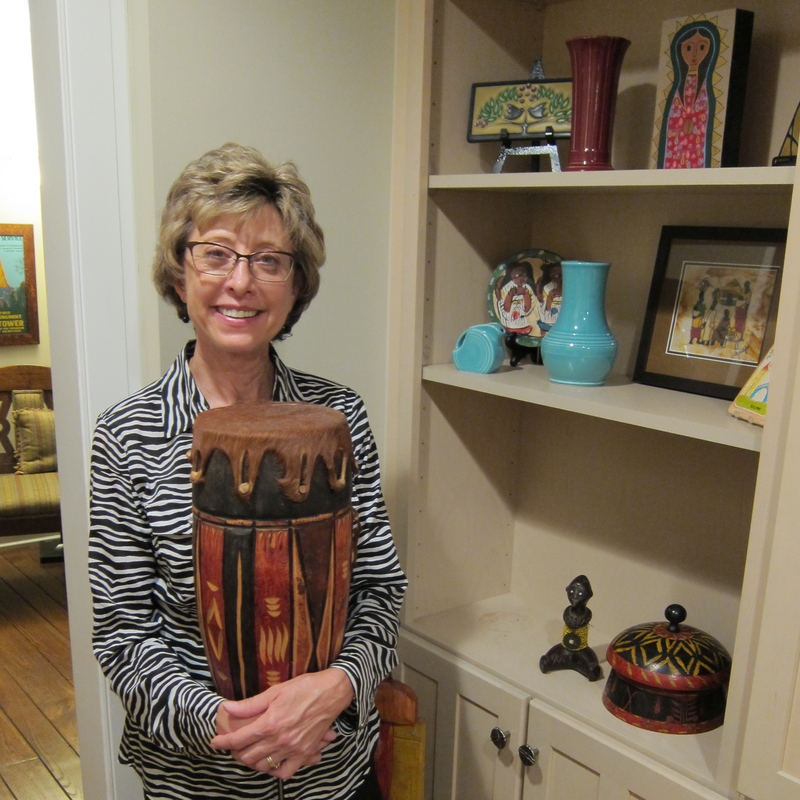 Just as every picture tells a story, Sue’s favorite souvenir, this drum from Swaziland, has its own story. They bought it on day three of an African journey to Zambia, Zimbabwe, and South Africa—a beautiful remembrance of their fascinating trip. Then Mark happily (?) carried it for the next 14 days of their 2.5-week trip. His version of this gotta-have-it-on-the-first-day-of-a-long-trip purchase is “The State of Africa” by Martin Meredith, a two-inch-thick, now well-thumbed, tome on 50 years of independence in the African countries. 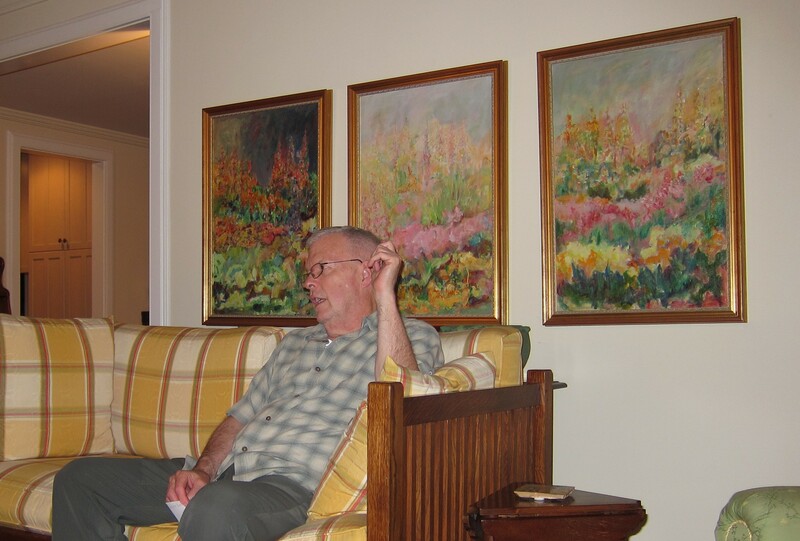 Mark sits before a series of vibrant Impressionist-style paintings from local artist Christiana Curry as he talks passionately about his job with the non-profit and non-partisan KidsOhio.org that he cofounded 13 years ago after working as an attorney with the Children’s Defense Fund. The group provides child advocacy, gathering research and recommending policy from fact-based findings. He’s especially proud that the KidsOhio team is building and enhancing a community coalition to support public education, a noble and rewarding endeavor. And now to the other Real Thing, the presidential library. Having 400 books is one thing, but each of these 400+ is written about or by a US president, not just the living ones, but going back to George Washington, every president, and several near presidents and first ladies included. Many of these volumes are signed. Most have been read, with small Post-its marking favorite passages. Mark’s favorite president? Frank Roosevelt because he provides perspective. FDR came from a wealthy family. Stricken with polio by age 39, he became a champion for the poorest Americans. In difficult times, he was able to educate and motivate the country through his fireside chats. 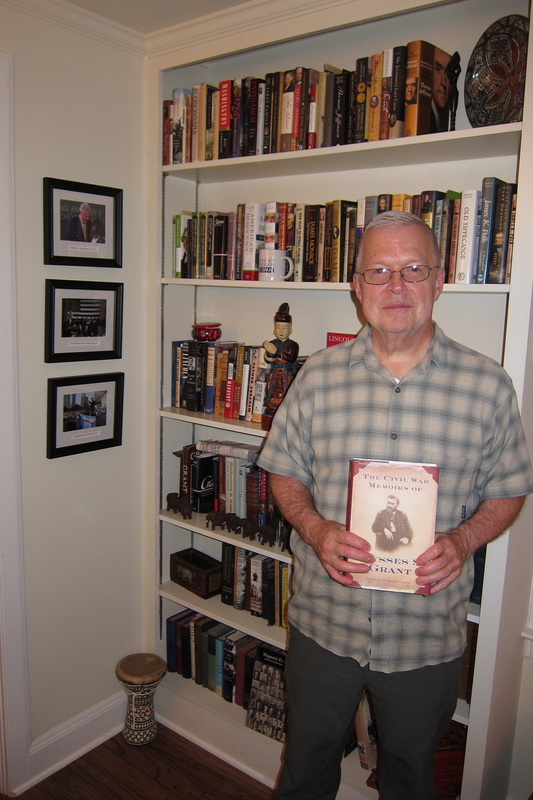 Ask Mark about any of the presidents and you will get a thoughtful, detailed, historically accurate answer, often with a sampling of humor or non-political insight about the president and the country during his term. Mark’s interest in the presidents led to a goal of visiting the birthplace or home of each one. This meant 43 locations (not 44 since Grover Cleveland was the 22nd and 24th president) and they’ve traveled from New Hampshire to Missouri and Michigan to California, actually more stops since he added presidential libraries and burial grounds for many of these men. (No women yet!) Sue, too, joined the fun. She happily kicked up her heels when they completed the string with Millard Fillmore’s honeymoon house in East Aurora near Buffalo three years ago. Mark, send us Sue’s heel-kicking photo to put here please! But what do you do when you’ve achieved your presidential aspirations? The Next Real Thing. 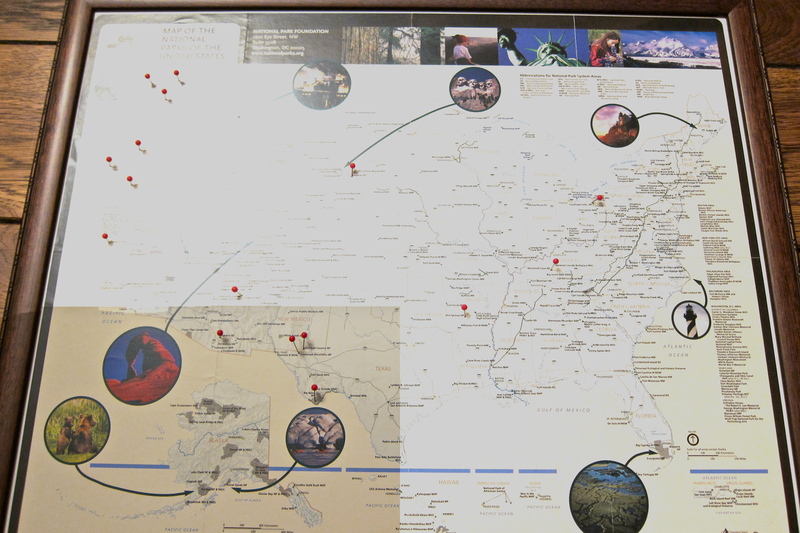 Now they’re on to visits of the US national parks, 59, even more with some national monuments, forests, and historic spots included. They’ve already made great progress. Sue has actually been to nearly all of these already in her early family trips, but she’s looking forward to rediscovery—a bit more comfortably this time—with Mark. After all, travel together is their thing. 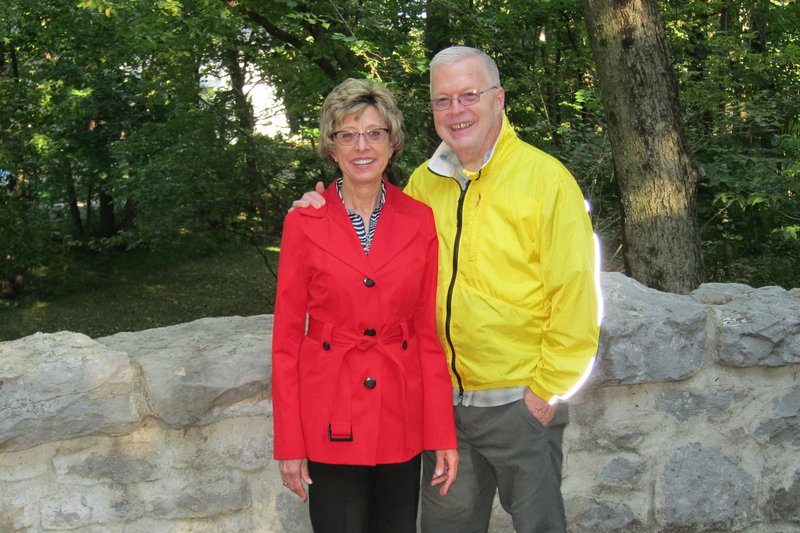 But sometimes it’s enough to just take a quiet walk (in their colorful jackets) around their peaceful neighborhood. I wonder if Dr. Seuss imagined the Reals when he wrote “Oh, the Places You’ll Go.” These two have Really gone! This entry was posted in Travel Journal and tagged KidsOhio.org, national park, Ohio, president, Real. Bookmark the permalink.